The horseshoe effect is a well known and discussed issue with principal component analysis (PCA) (e.g. Goodall, 1954; Noy-Meir and Austin, 1970; Swan, 1970). Similar geometric artefacts also affect correspondence analysis (CA). In part 1 of this series I looked at the implications of these "artefacts" for the recovery of temporal or single dominant gradients from multivariate palaeoecological data. In part 2, I introduce the topic of principal curves (Hastie and Stuetzle, 1989). 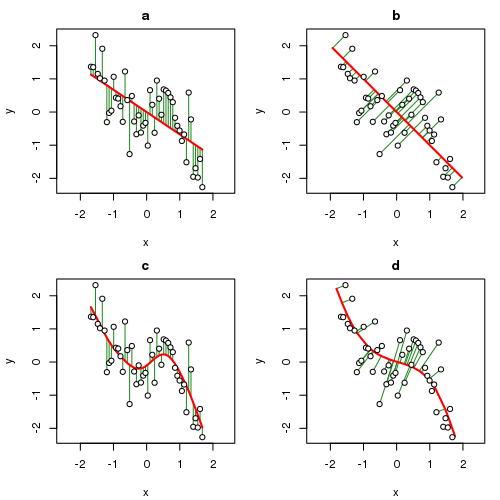 Fitted relationship between x and y (solid line) and the minimised errors (green line segments) for (a) least squares regression, (b) principal components analysis, (c) cubic smoothing spline, and (d) a principal curve. For our purposes, think of \(x\) and \(y\) as being two species. In the OLS solution, the sum of squared errors in \(y\) are minimised by the fitted line and hence \(x\) and \(y\) play different asymmetric roles in the model; uncertainty in \(x\) is considered to be zero and all the random variation is in \(y\). Contrast this with the way errors are minimised in PCA; the error is now with respect to both \(x\) and \(y\) and hence the distance from a point to it's location on the principal component line is orthogonal (or at 90°) to the line. In both cases however, the fitted line, the "model", is linear, a straight line. Splines of various sorts have been used to provide non- or semi-parametric fits between \(x\) and \(y\). In panel (c) of the plot above, a cubic smoothing spline is fitted to the sample data. As with OLS, the CSS minimises squared errors in \(y\) only; it is a regression method after-all. The difference is that the fitted model can be a smooth curve rather than a straight line. Prinicpal curves combine the features of the PCA approach with those of the spline. The corresponding principal curve for the sample data is shown in panel (d) and is a smooth, non-linear fit but this time the fit has minimised the error in \(x\) and \(y\). The errors are orthogonal to the principal curve and join the observation with the point on the curve to which it projects, in other words is closest to. I'll look at exactly how that is done later in this post. These two steps are iterated to convergence and can be arranged in any order; you can start with either the projection step or the local averaging step. In the projection step, the sample locations are projected onto the current PC by finding the location along the curve closest to each point. Closest is defined in the same way as for PCA, namely the length of the line orthogonal to the curve that joins the sample point and its projection point on the curve. For the local averaging step, one end of the curve is chosen arbitrarily and the distance along the curve from this end is determined. These distances are then used as the predictor variable in a smooth regression model to predict the response values of a single species. A model is fitted in turn to each species. This step has the effect of bending the curve towards the data. The type of smoother used for the models is a plugin to the PC algorithm; smoothing splines were initially used, but any smooth regression model could be employed, such as a kernel smoother or regression splines, or a generalized additive model. Convergence is declared when the fitted curve is sufficiently close to that of the previous iteration, the meaning of sufficiently close being controlled by a threshold parameter that can be varied by the user to allow for more or less strict convergence. 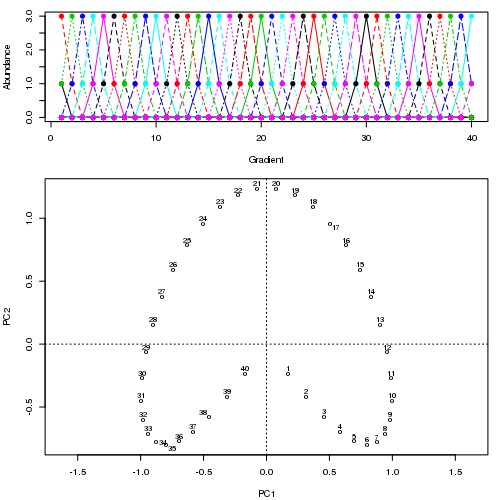 As with the data in the earlier post, when ordinated using PCA a very strong horseshoe is apparent in the solution. Projecting points on to the first PCA axis for example, the true ordering of samples along the gradient is lost at the ends of the axis where the horseshoe bends back on itself. Progression of the PC iterative algorithm as it adapts to the example data set. PC Converged in 33 iterations. Fitted curve uses 336.433 degrees of freedom. The curve explains 39% of the variance in the example data set and whilst there is a significant amount of unexplained variance, the PC is a significant improvement over the % fit that the PCA affords these data (the value displayed below is a proportion) although it does use a significantly higher number of degrees of freedom in doing so (~336 compared with 42 for the PCA --- the first principal component is a linear combination of 42 species scores.). There's not a whole lot more to principal curves, except a bit of fiddling and plenty of details on how those smoothers are fitted. I don't want this post to turn into an even larger missive than it already is, so I'll postpone those details to another post. In the meantime, I'll show a principal curve fitted to the Abernethy Forest data I introduced at the end of the previous post. I'll quickly run through the code without much explanation as I'll cover the details in part three of this series. 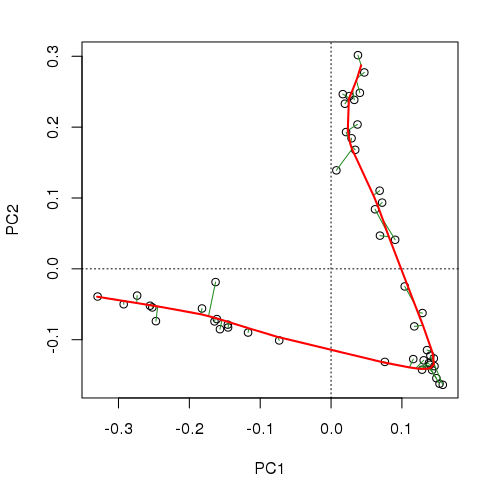 The plot below (code not shown for this) shows how the responses of the main taxa in the data set vary as the algorithm iterates to convergence in six iterations. The major changes happen in the first 2 iterations. Individual smoothers fitted to the Abernethy Forest data set for the 9 most abundant species. Principal curve fitted to the Abernethy Forest data set. Fitted curve uses 218.339 degrees of freedom. and we'd need 4 or 5 PCA axes to do as well as this, and even then we'd be in the unenviable position of having to visualize that 5d space. The principal curve, whilst using a larger number of degrees of freedom (~220 vs ~180 for a 5-axis PCA solution), embeds the same amount of information in a single variable, the arc length distance along the principal curve, which may be used as one would a PCA axis score. By way of some eye candy to close1, the output of plot3d(aber.pc) is an rgl device window which contains a spin-able, zoom-able 3D representation of the data and the fitted curve. The axes of the plot are the first three principal components, the points are where the samples rfom the core are located in this reduced space and the orange line is the fitted principal curve. Rather than show a static image, I used the rgl package to spin the display and wrapped this up in a video, displayed below. The video can be streamed but weighs in at 11Mb (! --- I struggled to keep the text legible), just so you know. Seeing the curve (and the data) in three dimensions rather than the usual two is quite illuminating! That's it for part 2. Next time I'll take a closer look at the prcurve() function, what the options for fitting principal curves are, among other things. De’ath, G. (1999). Principal curves: A new technique for indirect and direct gradient analysis. Ecology 80, 2237–2253. Available at: http://www.esajournals.org/doi/abs/10.1890/0012-9658(1999)080%5B2237:PCANTF%5D2.0.CO%3B2 [Accessed May 31, 2013]. Goodall, D. (1954). Objective methods for the classification of vegetation. III. an essay in the use of factor analysis. Australian Journal of Botany 2, 304–324. Available at: http://www.publish.csiro.au/paper/BT9540304 [Accessed June 3, 2013]. Hastie, T., and Stuetzle, W. (1989). Principal curves. Journal of the American Statistical Association 84, 502–516. doi:10.2307/2289936. Legendre, P., and Legendre, L. (2012). Numerical ecology. 3rd ed. Elsevier. Noy-Meir, I., and Austin, M. P. (1970). Principal component ordination and simulated vegetational data. Ecology 51, 551–552. doi:10.2307/1935398. Podani, J., and Miklós, I. (2002). Resemblance coefficients and the horseshoe effect in principal coordinates analysis. Ecology 83, 3331–3343. Available at: http://www.jstor.org/stable/3072083. Swan, J. M. A. (1970). An examination of some ordination problems by use of simulated vegetational data. Ecology 51, 89–102. doi:10.2307/1933602.